The following images are some from our archives and files. with a character height fixed at 200mm and 3 Digits for the score at a fixed numeral height of 300mm. The colour is also fixed. Our board does exactly that but enables the character and numeral heights to vary up to 400mm and is full colour. We will also provide a clock showing the time of day or if used for football it can be a count up or count down clock. The full line can be used to display many other pieces of information. The scoreboard above is actually 5000mm wide but the script shown is 4000mm and this might be the width of your scoreboard. The character height in the above picture is 350mm. Here I have wound the brightness down even further than the above pictures and the scoreboard is being used for football. Any message can be free typed and displayed. The pictures above are from our workshop during testing. The panels on either side of the clock were set for fixed advertising. 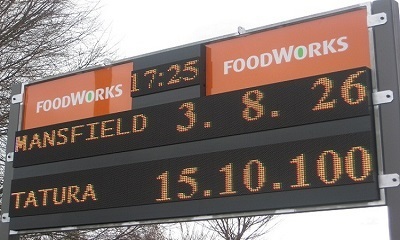 Here is the same scoreboard with the sponsor’s advertisments fixed. 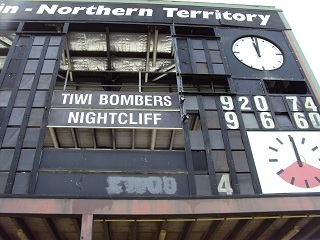 The same scoreboard displaying a footy score. 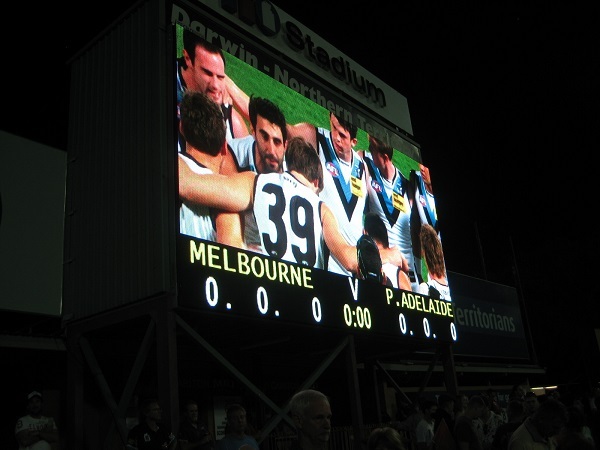 The 7 pictures above are all of the same scoreboard 5000mm Wide x 2400mm High. The Pixel Pitch is 25mm. ( Warning ) When talking about Pixel Pitch always, always ask the exact distance between the Blue LEDs. This is the true pixel pitch. Some suppliers will claim that with smart software their displays with Blue LEDs 40mm apart will be a good as displays with Blue LED’s 20mm apart. The letters & numbers can vary from 100mm high to 450mm high. Our displays are all Full Colour Displays so you can choose any colour you wish. 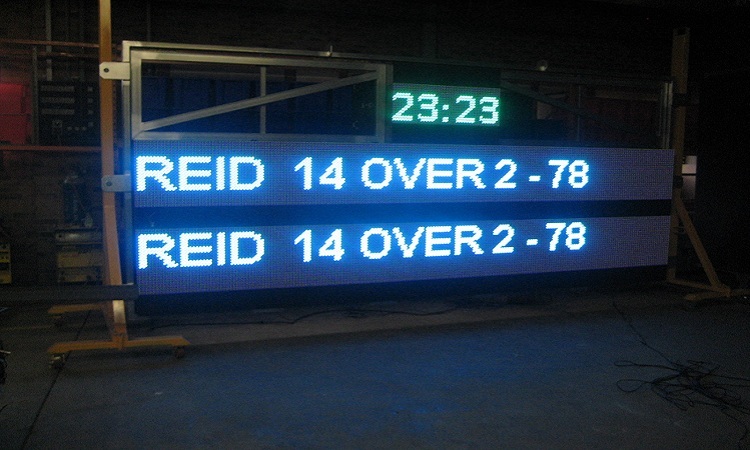 Character height and colour are easily selected from the standard software which comes with a Tecnovision Scoreboard. 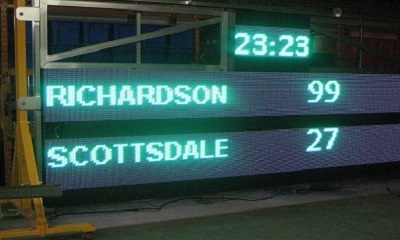 Version A of our standard scoreboard is shown above. You can see there are 3 x LED sections. (1) The Clock (2) Line 1 showing the Mansfield Score and (3) Line 2 showing the Tatura Score. 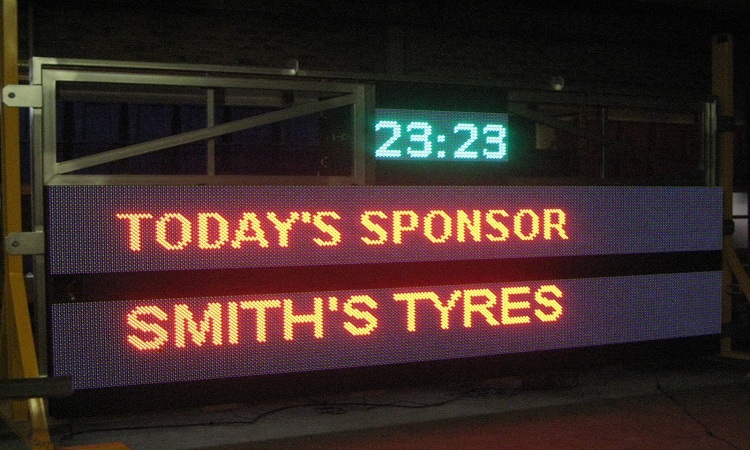 Version B of this board is a total LED board with no spaces for Fixed Advertising Panels and no spaces between lines. It has more LEDs and is therefore slightly more expensive. Here is a Specification Sheet that can be used by clubs when asking for prices for scoreboards. Modify it as you wish. 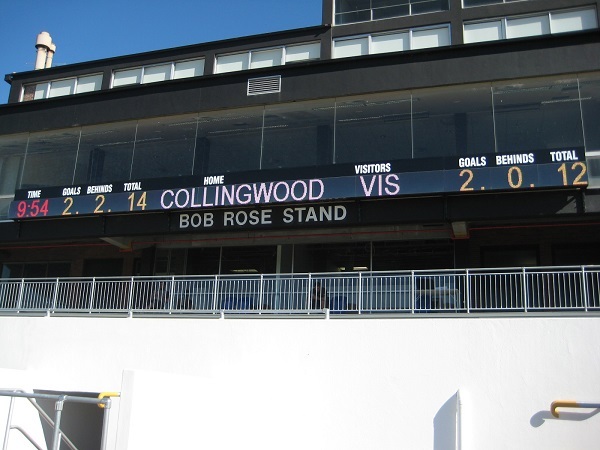 (1) The Purpose: The scoreboard offered and provided must be fit for use outdoors to display scorelines for Football and Cricket. It must be full colour and support the easy display of sponsor’s advertising. (2) Pixel Pitch: The True or Physical Pixel Pitch must be no greater than 25mm. This means that the spacing between the Blue LEDs must not be greater than 25mm. (3) True Pitch: Virtual Pixel Pitch or Enhanced Pixel Viewing is not acceptable. (4) The Scoreboard Cabinets must be fully weatherproof. (5) How many lines of characters 300mm in height can your display show at one time ? (6) How many characters 300mm in height can your display show on any one line ? (7) In your answer to (5) how many pixels are the lines spaced apart. (8) What is the brightness rating (NITs) of your display ? (9) Does your price include any form of dimming for night time use ? (11) Describe the functions included in the scoring software offered. (12) Describe how Sponsor’s Advertsiements are shown.Please state whether they can be compiled for sequential playing. (13) Does the scoring software have any statistical gathering features ? (14) Describe Vandal Proofing Features included in your offer. (15) Does your quotation include the total design and installation, including the structure, footings and cabling ? (16) Does your quotation include Engineering Certification of the Structure ? 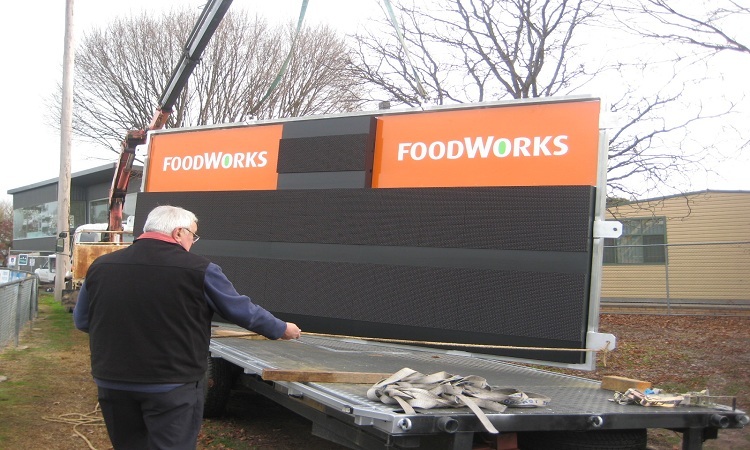 (17) Please provide contact details of the client who has purchased the largest scoreboard you have installed in Australia. (18) Please state the number of scoreboards you have supplied where the scoreboard component was (1) over $20,000.00, (2) over $50,000.00, and (3) over $100,000.00. (19) Where can we view a scoreboard of exactly the same resolution and brightness rating as the one offered ? If not the same resolution please state the variation. (20) Please advise who we call on game day if the screen fails to start up. (21) Please describe in detail your warranty terms. Specify what we must pay for in order to obtain a warranty repair. (22) Please state where we should locate the scoreboard/screen for optimum viewing and quote any costs involved in providing power and data cabling to this site. (23) Your quotation must include an AFL siren and a description of how the timing component of your software will operate this siren. How do we operate it manually ? (24) Please describe the preferred maintenance schedule. (25) Please state the exact items of spare parts provided to us within the quoted price. (26) Please describe the training procedure and telephone support. (27) Withn our Club there are members with various skills and resources. Please state in detail what design assistance you will provide should we attempt to build our own structure. (please state if there are any costs involved). (28) What is the completion time frame once an order is placed ? (29) Where your scoreboard/screen displays numerals can letters be shown instead or are these character positions only for numerals ? (30) Your quoted price should show the component prices for (1) the scoreboard/screen delivered to our site but not installed (2) the structure delivered to site but not installed (3) the installation of the structure including the footings etc (4) the installation of the scoreboard/screen onto the structure and (5) cabling both power and data including connections. (31) Is there a remote On/Off switch for your scoreboard located near the scoring computer ? (32) Do you manufacture your own structures in house or do you contract them out ? (33) Where is the nearest installation to our proposed site that your company has completed ? 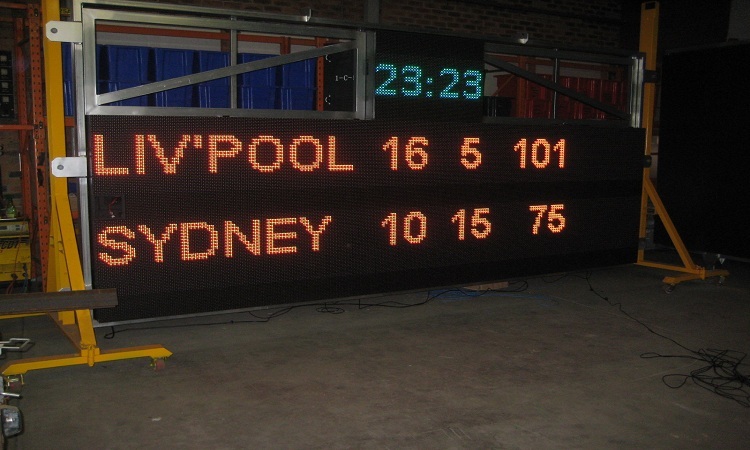 Our Tennis Scoreboards are used Australia wide. 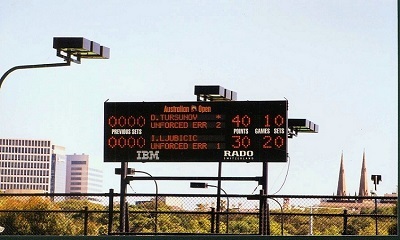 The above scoreboard is one of 27 units supplied and maintained for Tennis Australia. 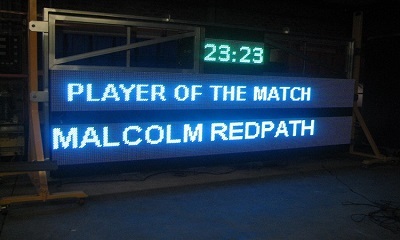 Designed by Graeme Smith this scoreboard is direct driven to permit quality viewing via TV cameras. 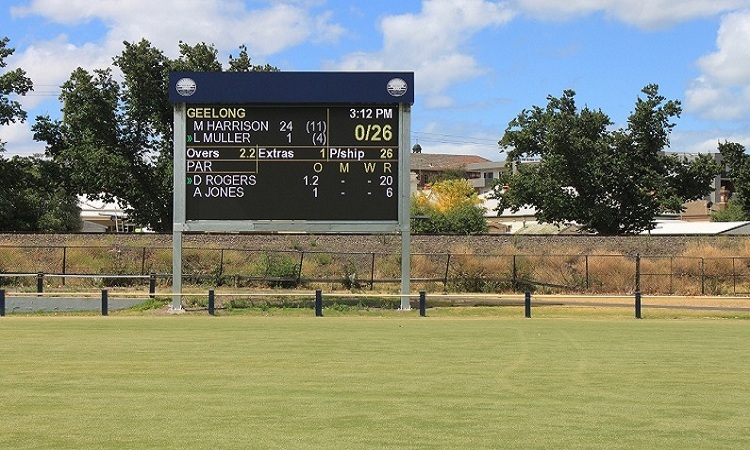 The LED portion of this Cricket Scoreboard at the Geelong Cricket Club was designed by Graeme Smith. The structure was designed and built by Tecnovision Australia. ………. and made this !